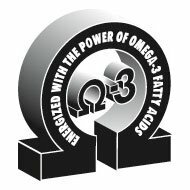 FlaxLic® is an all-natural supplement that contains a high level of Alpha-linolenic acid (ALA), an omega-3 fattyacid. FlaxLic® contains 15% fat, which is derived predominantly from flaxseed and edible linseed (flaxseed) oil. Flaxlic also is highly fortified with essential vitamins and minerals. This unique supplement is the first low-moisture block to contain a high level of ALA. This block is the product of a state of the art patented process that provides a unique 24-hour feeding system. FlaxLic® is an exceptionally dense, all-weather block that will give you the most for your money. 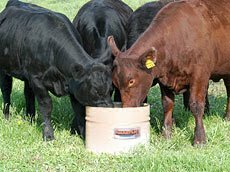 Economical: A low feeding rate of 1/2 to 3/4 pound per head daily translates to lower feeding costs (on a per head per day basis). Mineral Fortified: This supplement is mineral and vitamin fortified, reducing the need for additional free-choice minerals and ultimately lowering supplemental feed costs by as much as 5¢ to 8¢ per head daily. Minimal Labor: FlaxLic® is convenient and easy to feed. Simply place an adequate number of blocks in areas that are accessible to the cattle. Returnable Steel Tubs are environmentally friendly and eliminate the expense of costly packaging systems that can inflate supplement by as much as $40 to $80 per ton. Potassium is a critical component of electrolyte balance in the body. Potassium assists kidneys in maintaining the water balance, muscle contractions (including heart muscle function) and nerve impulse transmission. Forages tend to be excellent sources of potassium, with the best sources coming from early spring pastures that have not yet reached maturity. Selenium is necessary for tissue repair, normal function of the immune system, and reproductive performance. Selenium is interactive with vitamin E. A diet low in vitamin E may require an increase in selenium supplementation. A common symptom of deficiency is white muscle disease in young cattle characterized by lameness, stiffness, or cardiac failure. Vitamin A is required for growth, reproduction and maintenance; vitamin D affects calcium and phosphorus utilization and vitamin E helps to increase immune system function as well as interaction with the functions of selenium. *This research was supported by a grant from the North Dakota Oilseed Council. Effects of flax supplementation and a combined trenbolone acetate and estradiol implant on circulating insulin-like growth factor-I and muscle insulin-like growth factor-I messenger RNA levels in beef cattle. Effects of flaxseed supplementation on milk production, milk fatty acid composition and nutrient utilization by lactating dairy cows. Digestion, milk production, milk composition, and blood composition of dairy cows fed whole flaxseed. Bovine milk fatty acid profiles produced by feeding diets containing solin, flax and canola. Comparative evaluation of rumen-protected fat, coconut oil and various oilseeds supplemented to fattening bulls. Effects on composition and oxidative stability of adipose tissues.The effect of vitamin E supplementation of cow diets containing rapeseed and linseed on the prevention of milk fat oxidation.